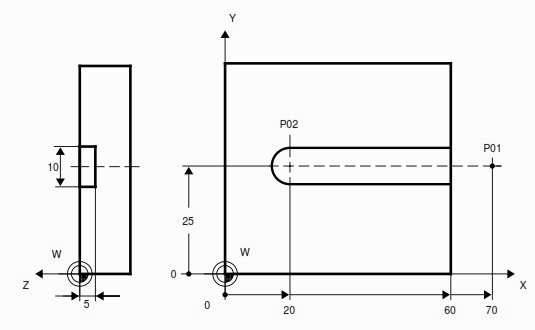 A very simple cnc milling program example which shows how a simple slot can be machined. Another such program example which mills a pocket the same way but in a taper is here CNC Milling Machine Programming Example for Beginners. N10 Spindle on clockwise rotation at 800 rev/min, tool rapid traverse to P01. N30 Tool traverse P01 to P02, feedrate 150 mm/min.